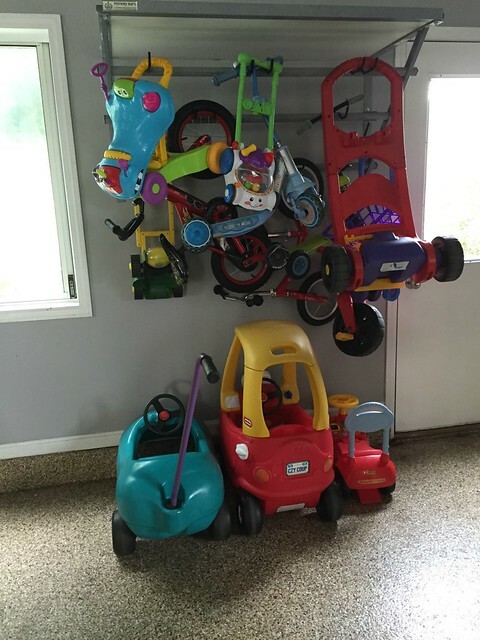 What-If-I-Need-It clutter (clothing you hope to fit into eventually, items that still have value but no real use to you now, baby items for potential future babies or grandbabies, etc). 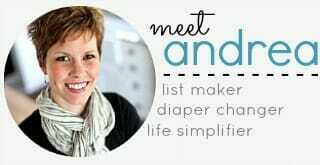 Obviously, those 2 categories alone cannot categorize every piece of clutter — but if you really stop and think about it, the majority of clutter in our homes and lives often falls under one of these 2 categories! I’ve shared some about sentimental and emotional clutter over the years… but that’s NOT what I want to focus on today. 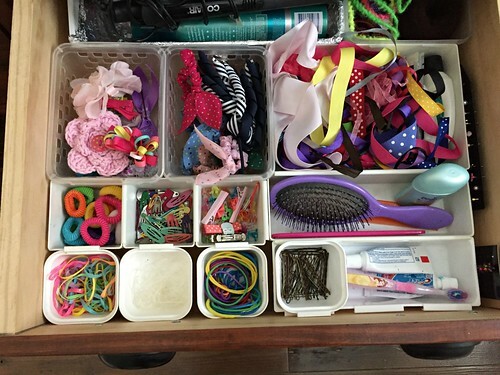 Today I want to focus on your What-If-I-Need-It clutter (I know you have some — we all do!) If you have trouble purging your What-If-I-Need-It clutter, I hope today’s post will help you let go of a few things! But what if you WON’T need it again someday? Is it worth hanging onto just in case? Or would you be better off purging it now? I suppose that’s the “million dollar question” for all your What-If-I-Need-It clutter! Whenever I’m faced with the task of sorting through What-If-I-Need-It clutter items, I ask myself the questions below to help logically decide whether to purge or keep. 1. How expensive would it be to replace the item? IF you actually do need the item again someday, would it really put a cramp in your budget to just go out and buy it again? If not, I would purge it now and enjoy the extra space! 2. How difficult would it be to replace the item? Is this item a one-of-a-kind treasure? Or could you easily find another one? Could you borrow it from a friend? 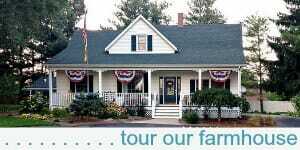 Could you rent it for a day from a local store? Could you potentially find it at a local secondhand or thrift store fairly quickly and easily? If it’s easily replaceable, that’s another good indication you can most likely purge now without much regret later! 3. Is there space to store the item? This question is sort of a no-brainer for me, because if I don’t have the space to store something, the chances of me hanging onto it is very slim. This question is especially helpful when I’m dealing with toys, books, and kitchen items. 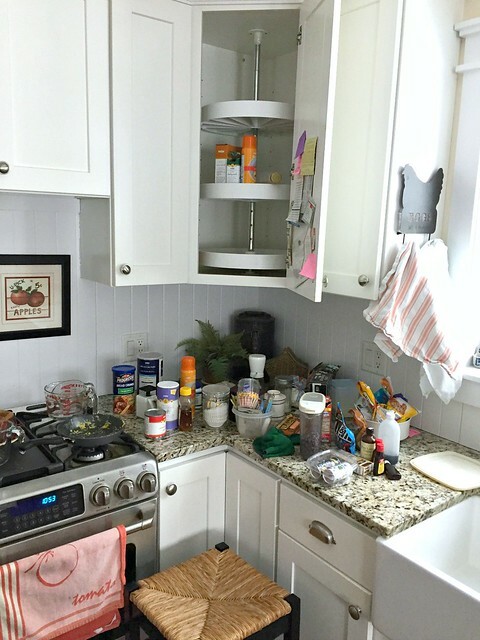 I don’t like things sitting out on counters or on the floor — so if I can’t fit the item into the designated storage space, that’s usually a good enough reason to purge it! NOTE: I actually don’t buy the jumbo size boxes of aluminum foil, sandwich bags, or cling wrap because they don’t fit as nicely in my drawer. 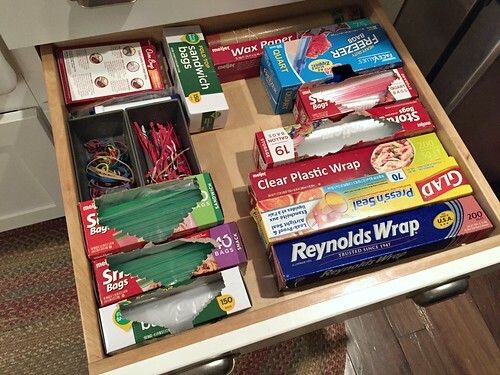 So, I pay a little extra in the long-run, but enjoy a nicely organized drawer every day! 4. Can something else be purged to make space? If I don’t have space to store the item, but feel I really want to hang on to the item, I then question whether there is something else I could purge instead. If so, I will keep the item for a bit longer — if not, I will most likely force myself to purge the What-If-I-Need-It item now! I use this method a lot with clothing. I only “allow” myself a specific number of hangers, so if the hangers are full, something MUST go before I add a new item in! 5. Could another item be a suitable substitute? There are SO many times in my own life when I easily make do with a similar item… especially when it comes to trivial kitchen gadgets, various accessories, certain clothing items, and even yard tools. Sometimes, I’ve even realized a better, more efficient way to do something because I had to improvise with a different item! 6. What’s the worst-case scenario if I regret a purge? This is another one of my favorite questions because it really forces me to stop and think… and it’s just so rational. 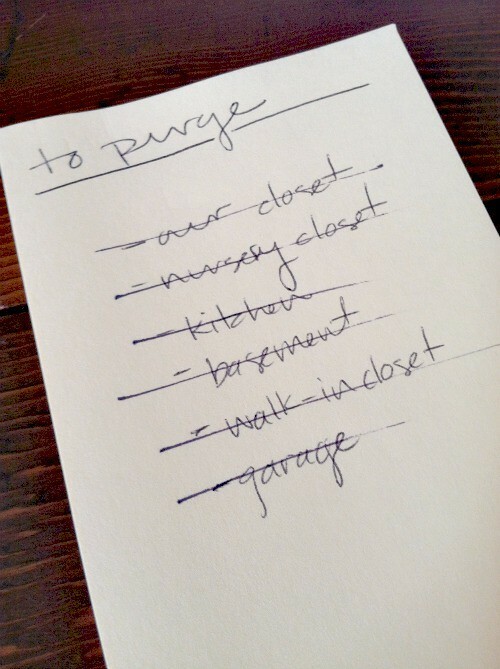 This is not a horrible scenario in my opinion… so I’d be more willing to purge. I’m sure I could continue with so many more questions — but these are the main ones I ask myself when I’m debating what to do with my What-If-I-Need-It clutter. I realize there are many factors that affect the amount of What-If-I-Need-It clutter you choose to keep and purge — and truly, there is no one-size-fits-all approach to this matter. 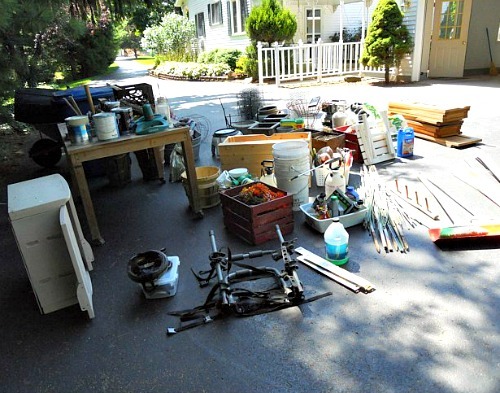 If you don’t live close to family and friends or you don’t have many connections in your area, it will be harder for you to find an item to buy used or borrow if you do actually need it again. If you are on a VERY tight budget and have no wiggle room for extra purchases, it could be risky to get rid of too much, as you might not have the funds to repurchase it at a later date if the need ever arose. 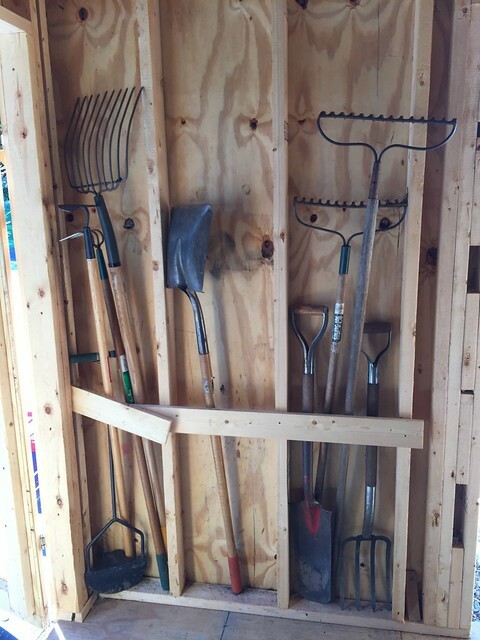 If you have a large amount of storage space and are fairly organized with that storage space, it might make sense to hold on to more What-If-I-Need-It clutter until you’re sure you won’t need it. However, if you have lots of friends and relatives you could potentially borrow from in the future, if you have a little extra wiggle room in your budget, and/or if you are short on storage space, I would strongly encourage you to think twice (maybe even 3 or 4 times) about what you are choosing to keep in your home just in case you might need it again someday. In my personal experience, and after years of helping others to declutter, there have only been a select few times when I’ve needed or wanted an item again… so my initial reaction is almost always to purge (I expand on my reasons why in this post)! If you need a little extra motivation to purge more What-If-I-Need-It clutter, try logically thinking through some of these questions (and be honest with your answers)! 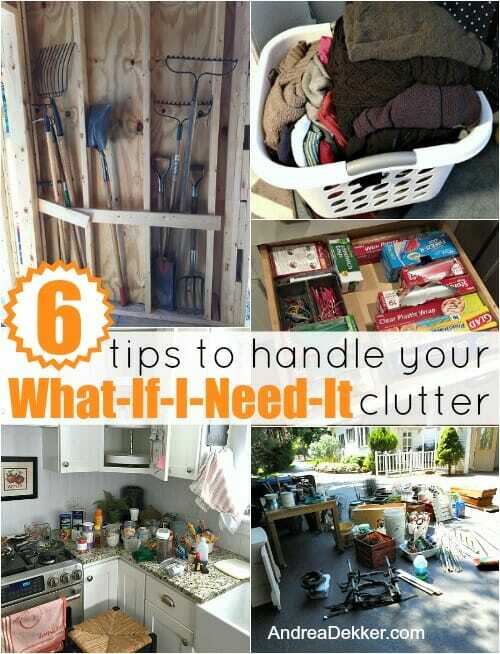 What type of What-If-I-Need-It clutter do you struggle with most? 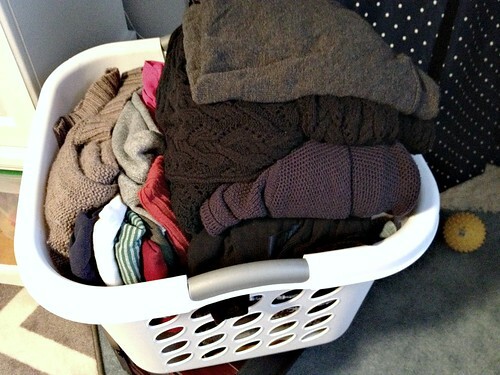 Decluttering has come more easily as I overcome a poverty or scarcity mindset. If I believe there is a limited amount of resources, I want to hold tightly to the resources I have. But if I believe that God has abundant, unlimited resources, I can let go of my stuff more easily. I trust that when I have a need, He has all the resources I could possibly need. He has all the resources of the universe at His disposal, and if that’s not enough, He can always create more! Trusting Him to provide me the resources I need (whether through my creativity or hard work or through someone else) makes it so much easier to let go of things I’m holding onto just in case I need them. As I freely give away my resources, plenty more keep coming to me. We moved recently, and I got rid of a small mountain of good stuff. I was tempted to have a garage sale or two, but decided to just give it all away to friends and the thrift store. For a “small housewarming gift,” friends of ours gave us two new lovely rocking chairs AND a swing for our new porch! These are things I’ve wanted for a long time, but they were definitely years down the priority list. I expect those gifts were worth more than I could have possibly made on a garage sale. God has plenty of resources, and He has all kinds of ways to get those resources to His kids. Thanks so much for sharing this — it’s EXACTLY how I fell too! 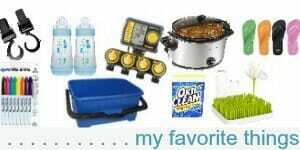 We get soooooo many freebies from family and friends and I find soooooo many amazing deals at our local thrift store, but I also give away SOOOOOO much of our stuff to family, friends, neighbors, and thrift stores. This one is so hard and Ive been burned by getting rid of stuff I thought I’d never need again. Here’s just two examples. I had a spare crockpot brand crock pot. I donated it to a school rummage sale. About three years later the one I kept died. I had to scour eBay for one not made in China. I’m kicking myself. Another thing that went to that same rummage sale was my big blue specked canning kettle. I couldn’t use it because at the time the microwave over the stove was too low. After remodeling I could use it. But guess what, again, if I can’t find an old used one, I’m sunk because I will not purchase anything made in China. I really wish I’d kept both of those items. I respect your commitment to buying American made goods, but I do suspect that makes it more challenging for you to find what you need if/when you need it. My husband is this way and it drizes me crazy. There is crap in our garage from forever ago but we cant throw it away because “we might need it someday.” Plus it’s not even organized which makes it worse. This is such a good reminder for me today. I’m in the midst of packing for our move next week. I just need to let go of all this stuff I think that I might have a use for one day. Honestly there have only been 1 or 2 items that I’ve regretted donating, and I haven’t missed them badly enough to shell out the $10 to $15 it would cost to replace them. Win Win! moving is definitely a good motivator to purge, purge, purge! Good luck! I used to hold onto things “because I might need it.” Then one year when I taught in the classroom(before kids and we were struggling to get pregnant after 4-1/2 years of trying and losing our first baby), I felt like I needed to just use everything. I didn’t know why, but I just went with it. The kids had a BLAST with my extra stickers, papers, etc. Then I ended up getting pregnant and leaving my position as an elementary teacher at the end of the school year. The school ended up closing down, so I was SOOO glad that I had used my stuff. It would have just sat in my garage and gotten ruined or would have been thrown away anyway! I totally use your line of thinking with this!!! Also as far as holding onto things for when my kids are older: My in-laws saved every little toy. Every. Little. Toy. Not only that, but the stuff has been been in the basement for 30+ years and smells awful and is full of “you have to wash it 20 times to get the 2 inch thick dust off it.” So I am keeping this in mind for saving their stuff, too. Consigning or giving to friends is so much better!!! Now I will say my dad saved quality toys and kept them clean. That’s what I’m aiming for with any I save! oh wow — what a great story! I’m glad you used up your supplies too!